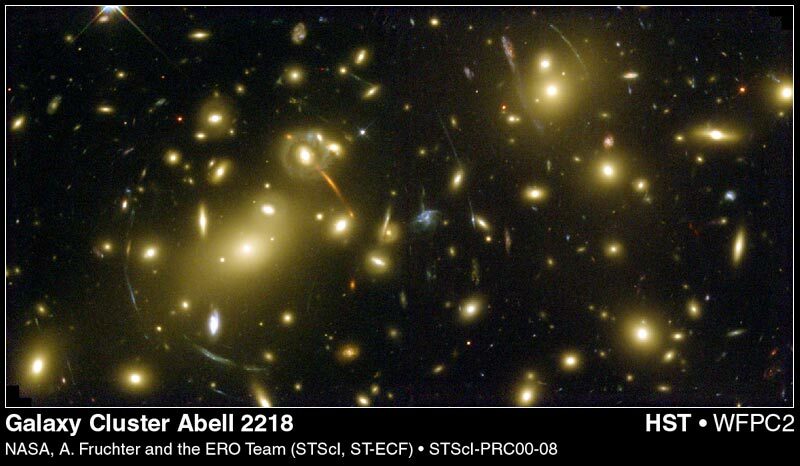 If we look carefully at the image taken with the Hubble Space Telescope, of the Galaxy Cluster Abell 2218 in the constellation of the Dragon, a few strange luminous arcs may be observed. What are these curious objects? Do luminous bodies with this strange shape exist in the Universe? The answer to this question belongs to one of the most interesting and fruitful fields of research in modern astrophysics: the phenomenon of gravitational lenses. 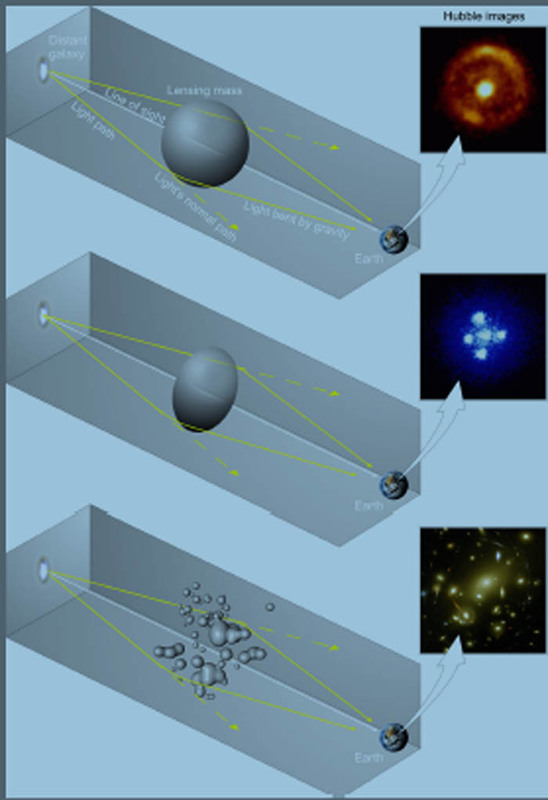 Thanks to gravitational lensing we are able, today, to measure the distribution of dark matter directly and to estimate the total mass of the Universe, and to define what its final destiny shall be, with greater precision. However, the phenomenon of gravitational lenses has been known for about a hundred years, but we have been able to observe it and to understand its enormous potential only in the 80s of the last century. In 1916 Albert Einstein published the General Theory of Relativity, in which it was stated that gravity is seen as a curvature in space-time itself (the four-dimensional structure of the Universe, whose coordinates are length, width, depth and time). The larger the mass of bodies, the greater will be the curvature of space-time, and the movement of the bodies subjected to a gravitational field will curve. As the famous American physicist John Archibald Wheeler said, “Matter tells space how to curve. Space tells matter how to move”. 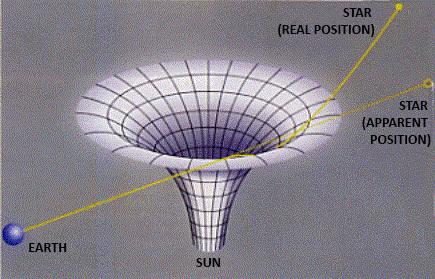 Always according to Einstein, a ray of light, exactly like a body which has a mass, is subjected to the action of the gravitational field, the result is therefore the curving of its trajectory. In fact if the light coming, for example, from a star happens to pass near the Sun, it is deviated by the gravitational field of the latter. This is exactly what was observed by the astro-physicist Arthur Eddington during the solar eclipse of May 29, 1919. Eddington verified that the rays of light that touched the disc of the Sun were deflected, and the amount of deflection was the value foreseen by the General Theory of Relativity. This experiment was the first direct proof of the correctness of the General Theory of Relativity. 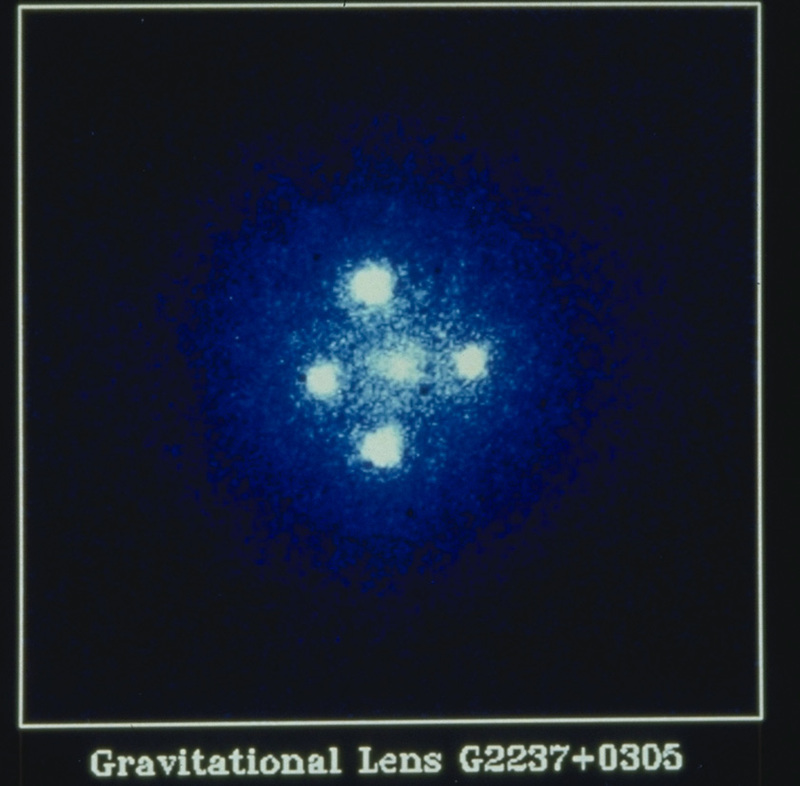 Einstein, therefore predicted the phenomenon of the gravitational lens far back in 1916. In other words, this phenomenon occurs when a ray of light is deviated from its path, which would otherwise be rectilinear, due to the presence of a massive body. The greater the deflection, the greater is the mass of the object between the light source and the observer, and the more oblique is the incidence of light. Since a source does not emit a single beam of light, but various beams, each one will travel at a different distance from the lens, deflection will be differential (i.e. different deflections, depending on the beam of light). The image coming from the source will be modified, and in some cases this deflection can lead to an enlarged size of the source. For this reason we speak of a gravitational lens, because the phenomenon is similar to what happens when a beam of light crosses a magnifying glass. Therefore gravitational lenses, which act like a magnifying glass, enable us to observe sources that may not have ever been revealed without this effect, because they are too small or weak. The discovery of the first gravitational lens dates back to 1979, when a decidedly anomalous behaviour was observed in a couple of quasars. The two quasars appeared to be very close, in fact they were only 6 arcseconds apart (1 arcsecond is the unit of measure used to indicate the angular size of a celestial object or the distance between objects in the sky) and appeared to be practically identical. In fact they both had the same luminosity and the same spectra, the same lines of emission and absorption, and it was noted they both had the same redshift, and they also were receding at the same speed. Immediately it was thought that they belonged to a binary system consisting of two quasars. In fact in astronomy it is not rare to observe systems consisting of two objects, as in the case of double stars, pulsars. However the possibility that the quasars both had the same spectrum, with the same emission and absorption lines was quite remote, also because it would have meant that the light of the quasars had crossed a cloud of gas and dusts that was not too far from the quasars themselves and that the cloud had characteristics (composition, shape, speed…) that were very unusual. 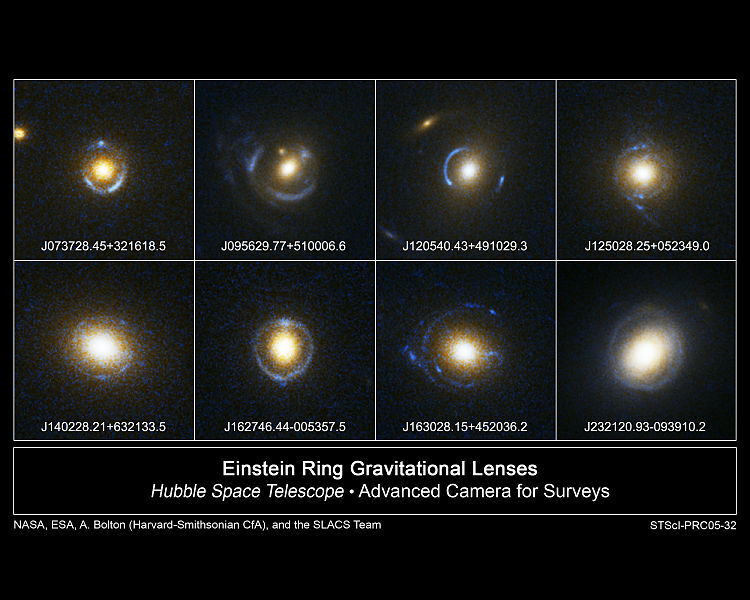 So it was declared that the first case of a gravitational lens had been discovered. What was observed, therefore, was not a system formed by two quasars, but by a single quasar whose image was split by the gravitational field produced by an object, probably an elliptical galaxy with a weak luminosity positioned between the quasar and the Earth. 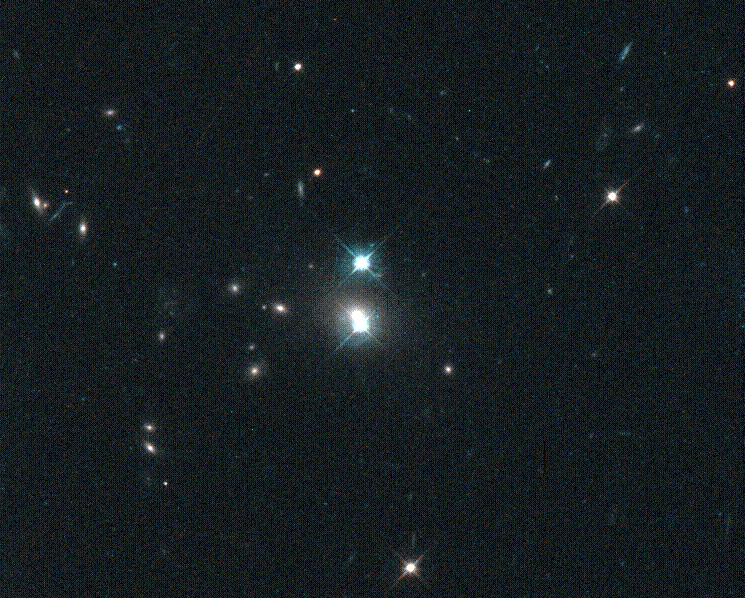 And so the first gravitational lens called Q0957+561, was discovered. 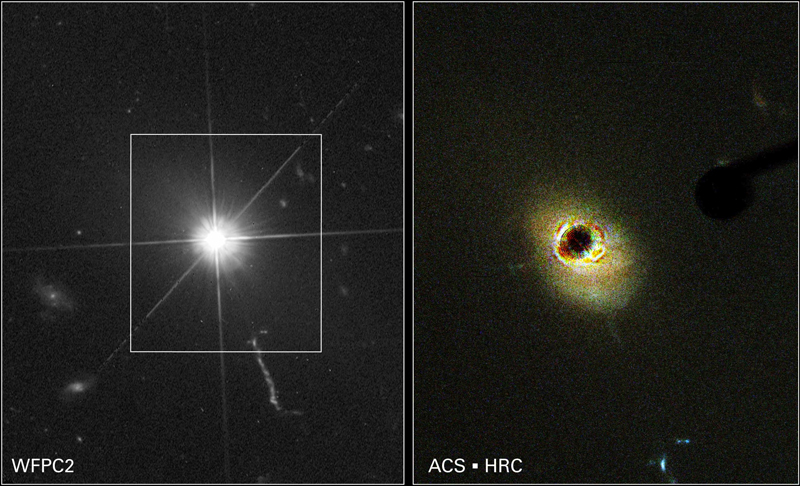 A quasar, the acronym for QUASi-stellAR radio source, is an astronomical object that, when observed with an optical telescope, appears as a punctiform source, therefore similar to a star, and from this it gets its name. If, however, we observe its spectrum, we discover a strong redshift which means that these are very distant sources that can however emit enormous quantities of energy, equivalent to that of a hundred galaxies. For this reason the quasars are among the most luminous objects of the Universe. Furthermore, they show rapid variations in their luminosity, which implies that they are very small, because an object cannot change luminosity faster than the light that crosses it. Probably they are the accretion disk of a super massive black hole that formed from the collision of the galaxies. In the years following the discovery of the first lens, more particular configurations were discovered: quadruple quasars, named the “Einstein cross” or the so-called “Einstein ring”. Let us take a look at some images of gravitational lenses, whose shapes vary depending on the distance and shape of the lens and the alignment of the object-lens-Earth. In the first image it can be observed that when the light from a quasar is deviated by a spherical lens with a homogeneous distribution of density, and the alignment of the quasar, the lens and the Earth is perfect, the resulting image is a luminous ring. In the second image it can be observed that when there is a perfect alignment of the source, the lens and the observer, and the lens is elliptical, as a result, 4 luminous objects, forming a cross shape around the lens, are obtained. Actually the four objects are no other than one quasar, positioned behind a galaxy. When the lens is formed by a non-homogeneous distribution of the mass (a cluster of galaxies) images of gravitational arcs are obtained. In the image, the mass of the Abell 2218 cluster of galaxies deforms the image of a distant galaxy, which can be seen in the shape of arcs. Among the many remarkable results in the field of astrophysics, which the gravitational lenses have enabled, a particularly significant one is the possibility of directly measuring the presence of dark matter in the galaxies and in the clusters of galaxies. The gas and stars that form the galaxies account for only a small fraction of the total mass of structures that are present in the Universe on a large scale. Spiral galaxies, like ours, are embedded in a halo of invisible material, which in fact is known as dark matter, which extends beyond the boundaries of the last stars. Evidence of the presence of dark matter is obtained by observing how the rotational velocity of the disk changes when the distance from the centre of the galaxy varies. If the movement were determined only by the gravitational force of what is being observed, beyond the visible limit of the galaxy the velocity should decrease, because as in the case of the planets of the Solar System, the further a planet is from the Sun, the slower is its rotational velocity. In fact Neptune rotates around the Sun much more slowly than Mercury. Instead, a different trend is observed in the galaxies: the velocity tends to remain constant even at great distances from the centre of the galaxy, which means that the gravitational force of a much larger mass acts on the external gas, than the force acting on the internal gas. Elliptical galaxies, just like the disc systems. have extended dark halos. Clusters of galaxies have a concentration of dark matter that is even greater than the amount measured in the galaxies. For the clusters to remain in equilibrium, the relative motion of the galaxies, that tends to break up the cluster, must be counterbalanced by gravity that tends to concentrate all the galaxies in the centre. Observing the velocity of the single galaxies of the cluster, it is possible to estimate the total mass, and it is noted that there must be a conspicuous mass, that we do not observe but which keeps the system in equilibrium. But how big is this dark mass? Today it is possible to estimate the distribution of the mass in a cluster by using this method of gravitational lensing. With the help of the gravitational lensing phenomenon we are therefore able to know the distribution of the mass inside the lens in greater detail, and therefore the dark matter becomes directly visible. Gravitational lenses can be used as an instrument to measure the distances of cosmological objects, i.e. they allow us to probe into the more remote areas of our Universe. In fact, with gravitational lenses the distance of the quasars, objects that are enormous distances away, can be measured with a great precision. Their distance today is determined by exploiting the theory of the expansion of the Universe, and more precisely, using Hubble’s law that relates the recession velocity of celestial objects to their distance. 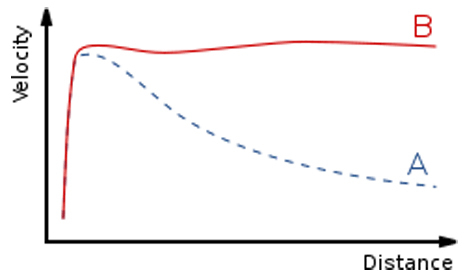 In Hubble’s law, recession velocity and distance are directly proportional (v= Hd). The further away the object, the greater is its recession velocity. However, in the formula the proportionality constant (H) is not known precisely, therefore continuous calibrations are required, by measuring the distances with alternative methods and comparing the results. This is done using gravitational lensing. The determination of the distances of the quasars exploits the fact that many quasars show very rapid variations in their luminosity. The image which is obtained will be made of two distinct images, at two different times, this is because the paths of light will be different. By measuring the delay in time and multiplying it by the speed of light, a measure of the difference in the path of the luminous signal is obtained, and from this the distance of the quasar is then calculated.